Societal problems cannot be solved by decision-makers alone. This is the thinking behind the citizen consultancy program World Wide Views (WWViews). The recent project on biodiversity held in India involved thousands of citizens across 25 countries and was a resounding triumph. Before the UN COP11 Convention on Biodiversity held in Hyderabad, India in October 2012, 3,000 people from countries as diverse as Canada, Bolivia, Uganda and the Philippines participated in day-long meetings which started at 9 a.m. in Japan and ended 25 hours later in Arizona, U.S.A. They deliberated and voted on a wide range of biodiversity-related topics, such as the protection of coral reefs, meat consumption, and overfishing. The participants showed a great interest in biodiversity, and indicated that involving them in the decision-making process had given them a feeling of ownership in the decisions. Results from the deliberations were bundled in a report that was handed to the Executive Secretary of the UN Secretariat for Biodiversity. The outcome of voting showed that there was strong, worldwide, public support for taking further political action to stop the decline in biodiversity. There were some differences in emphasis from country to country, but not between continents. 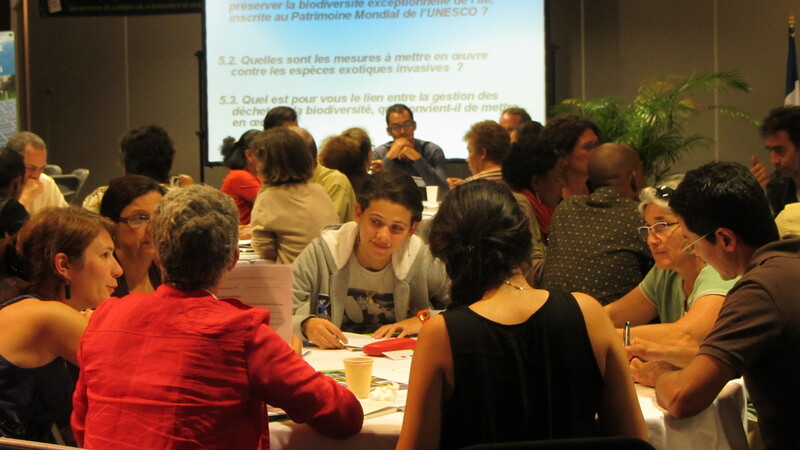 The WWViews1 Project citizen consultation contributed in an important way to the UN COP11 Convention on Biodiversity. Recorded in the final decision of the meeting is a call on all countries to support projects such as WWViews on Biodiversity. This is a resounding triumph for the WWViews method. The thinking behind WWViews is that societal problems cannot be tackled by decision-makers alone. Because of their global scale, they are complex and often require more than policy alone to solve them. Solutions to worldwide problems such as the decline in biodiversity and the need to reduce fossil fuel use must come from the broad base as well as the narrow top, and methods such as deliberative democracy enable decision-makers, experts, stakeholders and citizens to work together. In times of crisis, politicians can seem inattentive to citizens’ views. Yet making decisions in the absence of citizen support, however fast or ‘efficient’ it seems, leads to long-term problems if people feel their views are not recognized in the outcome. Time ‘saved’ is thus often time wasted because at some point there will be a demand for a decision to be revised. For long-term success, citizens can be made to accept decisions through being involved, even if those decisions are difficult or unpleasant ones. Professor Birgit Jaeger at the Department of Society and Globalisation at the RUC-Roskilde University in Denmark has monitored several events where policy is developed through citizen deliberation processes via the WWViews method. She is very positive about the World Wide Views Alliance in itself, which falls under the responsibility of the Danish Board of Technology and is connected with UN COP meetings. She suggests that it is perhaps an even more important phenomenon than the results of the meetings. With the UN giving World Wide Views its seal of approval, it has created a channel for citizens’ voices to merge into the decision-making process and created a platform ready to respond on many subjects on the UN agenda. The UN can directly tap into the opinion of people worldwide when it needs to. Partners interested in organizing citizen consultation are invited to get in touch with WWViews coordinator Bjorn Bedsted. The DBT are now fundraising, on behalf of the World Wide Views Alliance, WWViews2 on Biodiversity 2014 leading up to COP12 in Korea.